We should have seen this coming after his first two games inexplicably showed up on Steam a few years ago, but Bubsy The Cat, one of gaming history’s most maligned mascots and the star of one of the worst games ever made, is making a comeback. Earlier today, it was announced that a brand new Bubsy game, subtitled The Woolies Strike Back, is in development and set to release this fall for PC and PlayStation 4. If the trailer is anything to go by, Bubsy is as detestable as ever: After being awakened from his nearly 20-year slumber, the first thing he does is make a joke about reality TV. Seriously. The Woolies Strike Back looks to be a 2-D platformer in the vein of Bubsy’s 16-bit adventures, except with ugly 3-D models replacing the originals’ workmanlike sprites. 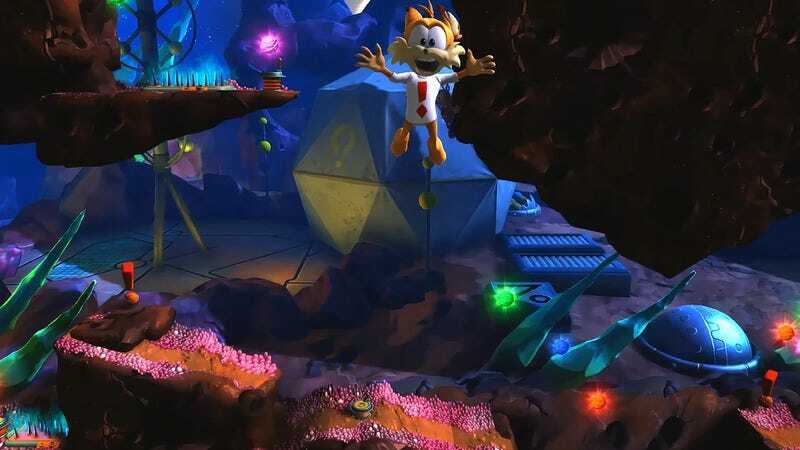 It’s being developed by the German studio Black Forest Games and a newly resurrected Accolade, the studio responsible for unleashing the original three Bubsy games onto the world. Its first incarnation was dissolved in 2000, but the name has been revived by Chinese publisher Billion Soft, a self-described “intellectual property manager” that’s “dedicated to bringing back your favorite games.” Apparently, they forgot the part where Bubsy is no one’s favorite game.